Oatmeal gets a bad rep a lot of the time. Sure, sometimes it looks like a big pile of EW. Hey, sometimes it even tastes like that. However, every once and a while you find a gem like this one. WOW! This recipe was my favorite out of all six that I tried. I groaned with each bite. I looked across the table at Barry’s and was jealous that he was eating my oatmeal. I wanted it back. I didn’t mean to put it in his bowl! Poor Annie didn’t even get a bite……she was happy with her Cream of Wheat – obliviously to my pure joy right beside her. We are breakfast eaters in the Myers’ household. If you are not, this recipe might just change your mind. The secret veggie? Sweet potato. Oh, and this recipe is so easy you just might start fixing it every day……warning – your family might get used to it. So, the cast of characters is as follows: milk, brown sugar, quick cooking oats (or old fashioned), pumpkin pie spice (or cinnamon), sweet potato, peanut butter, and vanilla. As I am writing this, I realize that I am going to get up in a minute and make this for breakfast. I can’t help myself. I’m looking at the pictures and I’m not able to say no. I need to hurry up and finish this silly post so I can eat! 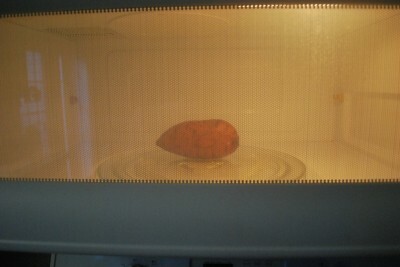 Stick your sweet potato in the microwave and cook it until it’s soft enough to mush. Oh, and sorry for the quality of these pictures. I was yet again cooking when it was dark outside, so I had to use the flash. Blah. I hate flash photography. Now, just scoop out the potato flesh and mash it. You don’t have to puree it like some of the other Deceptively Delicious recipes. Easy right? I had some leftover pulp, but Annie was happy. 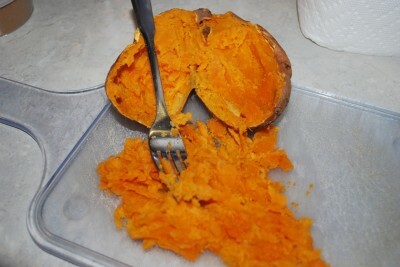 She loves sweet potato…..but not so much regular potatoes. Explain that one. Kids are weirdo. 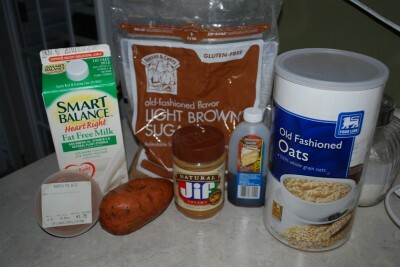 In a small saucepan, combine the milk, brown sugar, sweet potato, vanilla, and pumpkin pie spice. Bring it to a boil……not a hard boil though, just a barely boil. Is that clear as mud? 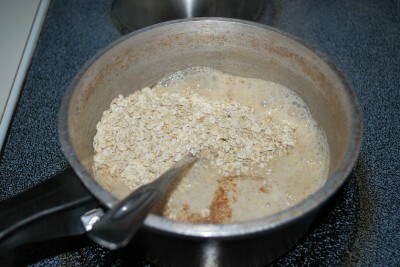 Pour your oats into the milk mixture and stir. Reduce the heat because we really don’t need it to boil now. See the pretty chunks of sweet potato in there? Simmer the oatmeal for about 2 minutes or until it starts to get creamy. Creamy is what we’re looking for – not a big hard blob of cement. If we wanted that, we’d eat breakfast at the school cafeteria. Oh, and what’s a simmer? It’s when bubbles just barely break the surface of your liquid….not a boil, but not NOT a boil. Clear as mud again? I pulled my oatmeal off the stove when it was the consistency I wanted. If yours is too thick then just add a little more milk and heat it up a tad. Plop your peanut butter in there and stir it around until it’s melted. 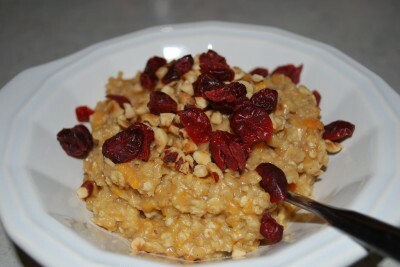 The oats are going to be warm enough to melt it, so you don’t have to stick it back on the stove. 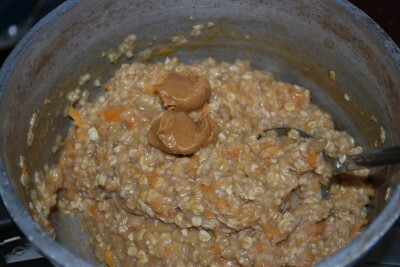 Spoon the oatmeal into two bowls and add toppings if you so desire. I put Craisins and hazelnuts on top of Barry’s. I just ate mine plain with a little maple syrup on top. Oh. My. Gosh. I am sitting here almost giddy because I know I’m making this again in a few minutes. Jealous? Don’t be….my kitchen is always open. Unless I’m asleep……or gone…….or busy. See? Always open. 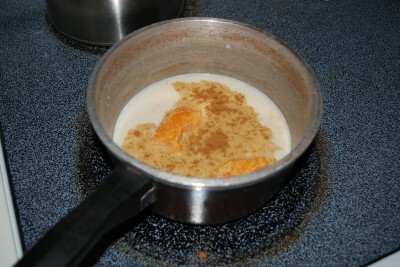 In a small saucepan, combine the milk, sugar, sweet potato, vanilla, and if using, and spice. Bring to a gentle boil and stir in the oatmeal. 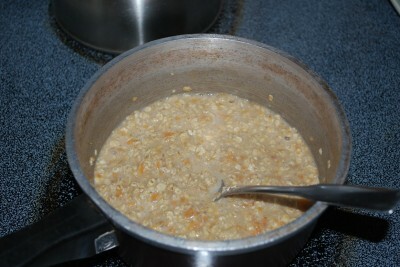 Reduce the heat and simmer for 2 to 3 minutes, until the oatmeal is soft and creamy. Stir in peanut butter, if using. 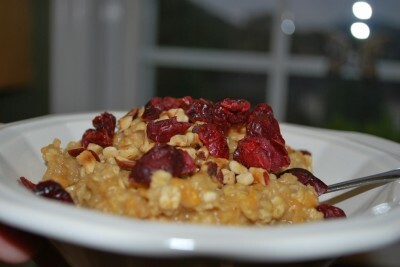 Spoon the oatmeal into bowls, sprinkle with dried fruit and nuts, if you like, and serve warm with maple syrup. How many servings does this recipe make? 1 or two? Or more? I can’t wait to try this! Pinning!! Enjoy! 🙂 I think I need to make it again this week…can’t get enough. Sounds delicious! I love oatmeal anyway…so this would really be great! !